Modern Hobie 16s have the Miracle 20 tiller connector, which is a huge improvement over the older bolted connection. Still, my connectors were a bit loose so I decided to overhaul them. From the left: Bolt, plastic washer, base (that fits into tiller arm), bearing, and end cap (that connects to the crossbar). So my rebuild consisted of replacing the plastic washers and using thin stainless steel washers directly under the bolt head to protect the plastic washer. Then reassemble with red Loctite and tighten until the slop is just gone. Some drag is OK; this does not need to be a zero-friction bearing. For each side you will need two tiller arm rivets 8010131 and one washer 8080691. The stainless steel washers were not Hobie parts; I don't even know where they orginally came from. 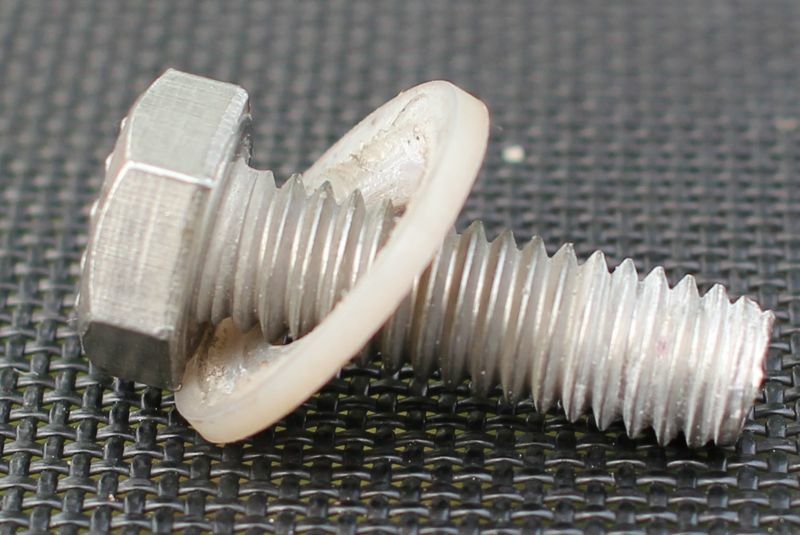 Find thin stainless washers that at least cover the bolt flanges and hopefully cover most of the plastic washer. Tighten until you begin to get some drag as you spin the parts against each other. All of the slop should be gone by then. Once the Loctite has set, re-rivet the assembly to the tiller arm.